"There's lots of dribbling and jealousy, not just from the finalists." Ex-Formula 1 driver Derek Warwick sums up the mood perfectly as George Russell waits in the McLaren-Mercedes MP4-26. Warwick, chairman of the McLaren Autosport BRDC Award judging panel, has just shared a word with the 2014 Award winner after the installation lap for Russell's prize F1 test. 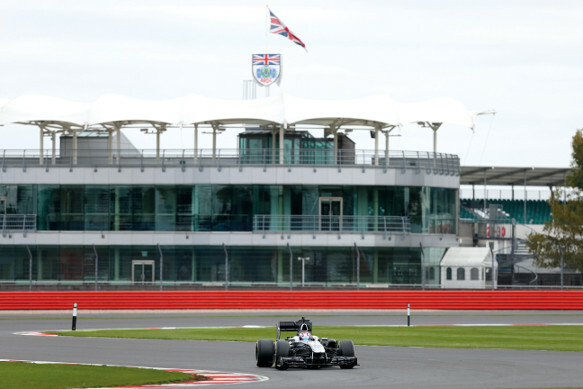 The 2015 finalists - at Silverstone to prove their abilities in Formula 2, Mercedes DTM and McLaren GT3 machinery - watch closely, as do the judges, McLaren personnel and onlookers. For Russell, like many drivers, the first time in an F1 car is the realisation of a dream and the nerves show briefly. "He was a little nervous as the time came to go out, but he quickly got comfortable," says McLaren demo and heritage manager Indy Lall. "What helped was when the six 2015 finalists came over." Laughing and joking done, the Mercedes V8 is fired up again and Russell takes the car - the very chassis Jenson Button used to win the dramatic 2011 Canadian GP - back out onto Silverstone's Grand Prix circuit for his first proper run. As with most winners, there's no problem pulling out of the pits, though he refrains from doing an Oliver Rowland (2011 Award winner) and deafening everyone with a big squirt on the throttle. Russell's first stint is tentative and when he returns the reason becomes clear. 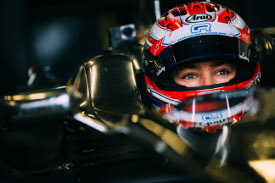 Contrary to what you would normally want on a 17-year-old's first go in an F1 car, the balance is too far forward, giving Russell oversteer in Silverstone's fast corners. "Generally, we don't need to put heat into the demo tyres, but we did here to be safe," explains Lall. "But the balance was more to the front, so it blistered the rears. His feedback is good." The balance still isn't quite there in the second run, despite a new set of tyres, but for the final outing it's sorted. Now Russell is able to push and the times tumble. From 1m41s on his first run, he is consistently in the 1m37s, with a best of 1m36.7s. 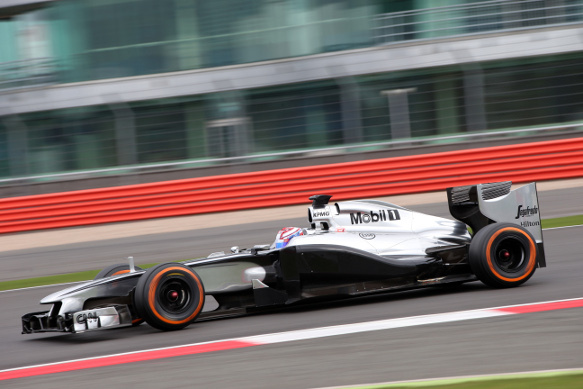 Conditions, the rubber and the car's set-up make comparisons vague, but Fernando Alonso's fastest lap in the wet-but-drying 2011 British GP was 1m34.908s, with Lewis Hamilton the quickest McLaren with a 1m36.180s. "Driving an F1 McLaren is amazing, it's unreal," says Russell as he climbs out for the final time. "It's a completely different league in terms of feeling and sensitivity. Everything's so special to each F1 car - there's no single-seater like it. "What surprised me is how easy the inputs were - with a Formula Renault 3.5 [which Russell has tested] it's really heavy to turn. This was light, like playing a racing game. It's precise; you can do what you want with it." He heads off for a debrief and a word with family and friends, sharing his special moment, but Autosport is able to catch up with him for a chat later on. Rookie Russell finished sixth this year in the Formula 3 European Championship, which only finished the weekend before his Thursday F1 drive. In between, he had to get into testing mode, but Russell believes the busy schedule was a positive. "I was really busy beforehand, so I didn't overthink the day, which was probably a good thing," he says. "The day came to me, though I did look at a lot of on-boards. I treated it like a normal test. Every time you go out in a racing car you've got to be quickest. It's still a racing car, just with more power and grip." That said, there was initial shock at the speed before his brain caught up. "I did jump in and on the first lap thought, 'bloody hell, this is fast,' and my head was pinned back, but quickly it feels normal," adds Russell, who did not change his training to prepare. "The car can do it and I didn't feel I had to build up." Russell is an impressive driver for someone with only two years' experience in car racing and he acknowledges he was much better prepared for the MP4-26 than he would have been 12 months earlier, when he won the Award. And he is still finding areas to improve. "The ability is the same, but I know a lot more about how cars with downforce work," explains the 2014 BRDC F4 champion. "I knew after I tested a Formula 3 car, I could have done the F2 better [in the 2014 Award tests]. You have to believe the grip is there. "After the first couple of laps in the F1 car I realised about getting your foot in to get the blown diffuser to work too. Again, you have to believe there is grip." His ability to work on the car's imbalance was key in getting the most from the test. Russell felt the final run was crucial to show what he could do. "I was here to put the car on the limit and I couldn't do that at the beginning," he says. "Something I've improved a lot this year is my feedback and I'd have been disappointed if the F1 test had finished after run two. It was really pointy and didn't give me confidence. "Run three was a lot better. I was almost flat at Abbey and was really happy with that. You don't imagine it's flat. In the F2, it's a lift and downshift. It would have been bad if I'd crashed, but - you never know - it could have been my last time in an F1 car. Though, of course, I hope not." That depends on how he builds on a mixed first season in European F3, the series that launched Max Verstappen into F1. Russell showed plenty of pace with Carlin and won at the opening meeting of the year, but results were sporadic. "I wasn't overly happy with the season," he admits. "The races where we were quick we didn't quite optimise it or were unlucky, like Norisring and Nurburgring. "We didn't have that last little edge, which I think was due to experience. People like [champion] Felix Rosenqvist and [runner-up] Antonio Giovinazzi have done several seasons. "I can't imagine how much more I'll know in two to three years' time. I've been really pleased with the end of the year - I've compared well to my team-mate Giovinazzi." A second season in European F3 beckons, and Russell will start 2016 as one of the favourites to win the title. If he can deliver on that promise, he'll be a step closer to realising another dream; that his McLaren run at Silverstone is merely a precursor to many more miles behind the wheel of a grand prix car. Who is F1’s personality of the year?